A few minutes ago, I don’t even know what a Subaru Justy was. But now I can tell you that it’s a small, light hatchback and would be a pretty great recipient to have the innards of a 4.6L Mustang Cobra stuffed into it. Wait…what? Thanks to Robert for commenting on the last post and adding a link to this project. The Justang was built by Circuit Motorsports. 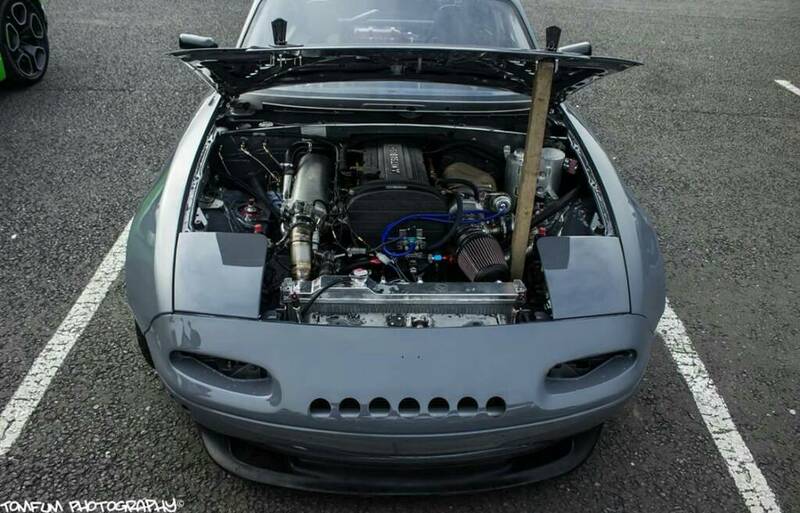 On this site alone, we’ve seen more than a few different types of MX5 engine swaps, including a 13B turbo, 20B PP, 2x LS3 V8s (here and here), and of course the standard engine converted to turbo (here, here and here) and even supercharged. More often than not, though, it’s the MX5 that becomes the donor vehicle, with many vintage chassis swaps using venerable Miata’s for their drivetrains. This build there, though, is one of the first times I can honestly say I’ve seen something entirely different applied to a Mazda roadster, in the way of a Mitsubishi Evolution 8 engine converted to rear wheel drive. Along with the very interesting engine choice comes a stack of gorgeous home-built fabrication work to set off the rest of the car, transforming it into a formidable track beast. Click here for more Mazda builds. Click here for more MX5 builds. Click here for more engine conversions. 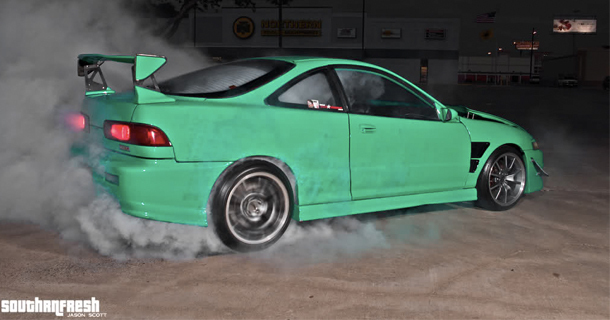 This build doesn’t start off with a bare shell, a neglected car found under a tree, or even anything remotely standard, it actually starts off with a Honda Integra that had already been featured in a magazine. So how can a build start off with an already complete car? Well, because the guts of the Honda gets removed and fitted atop a ’96 Mustang Cobra, creating a V8, RWD Integra. The interesting thing to note is that the owners inspiration for this build was actually the Civette, another Honda chassis swap that graced these pages. Thanks to Matt for submitting. 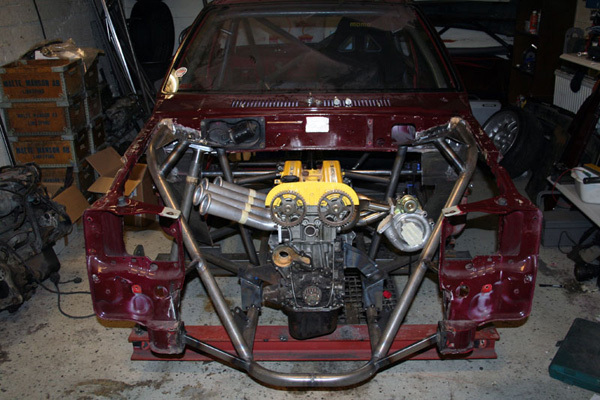 Click here for more chassis swap builds, or Honda builds, or Mustang builds! Remember this Lancia Delta I featured back in November 2009? No? Well, that’s okay, because I didn’t either! The build was submitted to me very recently, so after assessing it I started the usual process of putting the post together. It actually took me about 10 or so pages before the build started to look familiar. So why am I featuring it again? Because the car gets a full overhaul and is now a completely different beast compared to a few years ago. You’ll probably see pictures of it on the track on Speedhunters within their 2013 Gatebil coverage, so it seems as good a time as ever to share the build with you. Thanks to Bastien for submitting via the Facebook page. Click here for more Scandinavian builds. A few months ago I took a step forward in this little hobby of ours and bought myself a Mig welder. Since then I’ve made a few custom parts and brackets, added some new metal to my radiator support panel, and even helped a mate plug up some holes in his engine bay. 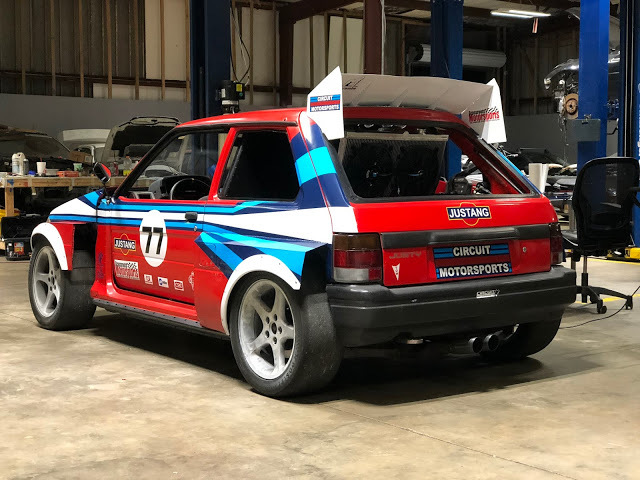 I was starting to feel pretty proud of my accomplishments; then I received an email from Cameron about his Peugeot 205 build and I came crashing back down to reality. You see, Cameron studied Motorsport Engineering and now works for Ford in the UK as a suspension systems engineer, so he knows a thing or two about how cars work, especially his Peugeot 205. The plan for this little hatch is a space-frame chassis with double wishbone and push-rod suspension, front engine (ish), rear wheel drive, ~350bhp and carbon panels for a target weight of 600kg including the driver. Be sure to keep an eye out for an update in the future when the car is closer to completion. I love posting updates to previously featured projects, but it’s always a bittersweet moment as it usually means there’ll be no more progress pictures to enjoy. 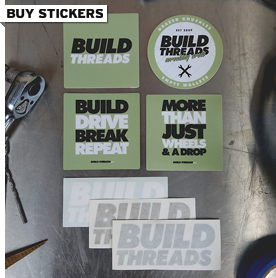 But hey, cars are built to be driven and bikes are built to be ridden, so we should rejoice when a build reaches it’s final destination. 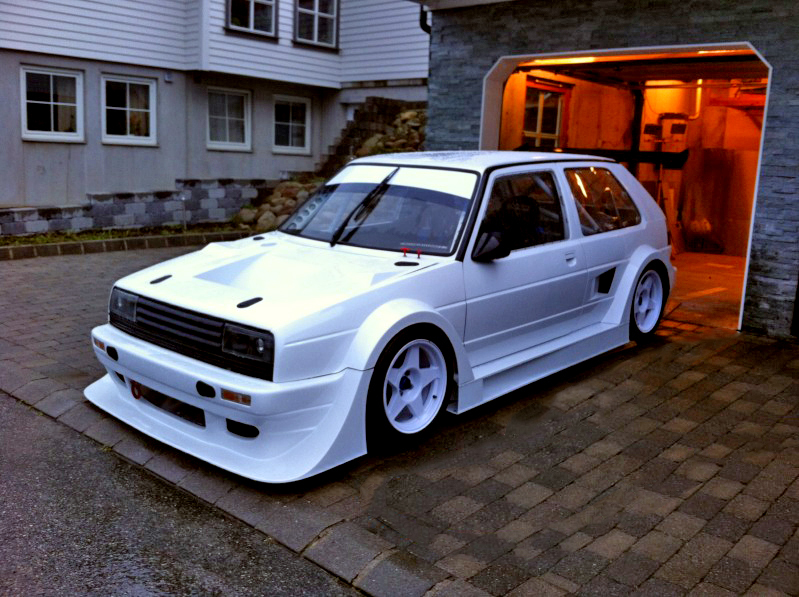 I posted this mid-engine converted MK2 Golf way back in June 2009, and it’s been one of the most popular cars I’ve ever put on the site, I always see links in my stats to this build popping up on forums regularly. Well, just this week a video was posted of the wide-body creating roaring into life, so it’s time to reacquaint yourself with this incredible home-built ride and see how much work has been carried out over the past few years. Fredrik, from the build-thread-rich forum known as Zatzy, emailed me his project late last year. 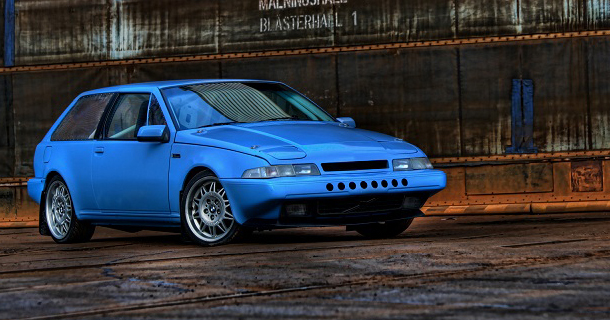 A Volvo 480 is a car I’ve never seen or heard of before, but after learning that this specific car was converted from FWD to RWD with a B234 engine and BMW ZF gearbox, I was more than interested. For more RWD conversion builds, click here. It seems the there are many members of the Honda fraternity who still undeniably love the marquee, yet are quite bored of the whole FWD thing. On this website alone there are 3 other builds documenting Hondas being DIY’d away from their standard drivetrain layout. There’s a front-engine RWD F20C CRX, a mid-engine rear wheel drive DC2 Integra, and an AWD Twin Engine Del Sol. This latest build uses a mixture of those combinations, giving us a mid-engine rear wheel drive CRX. Honda, are you listening? Thanks to Daniel for submitting. From the same forum that brought you the Viper powered Saab 93 Wagon comes another frankenstein build. Function-over-form readers will be pleased to notice the absence hectic stance, bags vs static arguments, ground clearance measurements or rusted body panels. This Golf is different…very different. I’ve featured a few MKIII Golfs before, each with their own impressive qualities, but none as all-out as this one with it’s Volvo T5 power, a change in driveline direction from FWD to RWD, and a whole lot of one-off fabricated goodness. 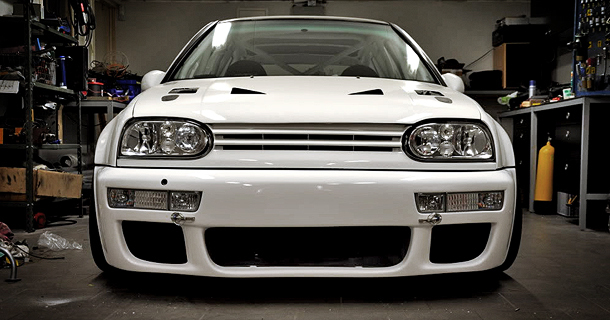 I think I’ve made up my mind, when I die I want to be reincarnated as a Scandinavian car builder. Race quality fabrication, bodywork, carbon fiber…is there anything they can’t do? This next build comes all the way from Sweden, a first generation Suzuki Swift sitting atop a custom tube frame chassis. The engine has been rotated 90 degrees and now powers the rear wheels. Not only has it been remounted, but it’s also received a little kick in the pants courtesy of a turbocharger and pumps out over 260 dyno-proven kilowatts. Damn these Scandinavians with all their fabricating skills, there must be something in the water. 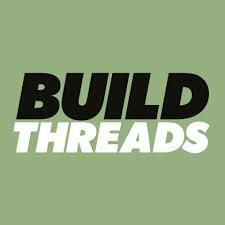 There are so many great builds that come from Scandinavian countries that I’ve decided to create a Scandinavian Post Tag that you can use to find builds stemming from these skillful folk.. Thanks to Audrius from the Lithuanian forum per4m.lt for submitting this one.